Melting Furnace: Meltec Remelting Furnace, capacity 500Kg Zn/hr with Metal Transport Furnace and scrap conveyor. 1-off Frech DAW200S-RC Hot Chamber Die-Casting Machine with 200 tonnes locking force, Data-Vario Processor controller and 3-Stage injection unit. Complete cell with Gripmat pick and place Robot & 20T Hare Clip Press. Total shot weight- 4200 grammes. 1-off Frech DAW125S Hot Chamber Die-Casting Machine with 125 tonnes locking force. Data-Vario Processor controller and 3-Stage injection unit. Includes weighing m/c to monitor m/c safety and quality of parts. Total shot weight- 2100 grammes. 3-off Frech DAW125SBC Hot Chamber Die-Casting Machines with 125 tonnes locking force. SBC 2.0 controllers and 3-Stage injection units. 1 off m/c with Snair pick & place Robot and cooling conveyor. 1-off with Fanuc foundary robot in complete in Cell with 23 Ton Clipping press. All include weighing m/c to monitor m/c safety and quality of parts. 1-off Frech DAW80C Hot Chamber Die-Casting Machines with 90 tonnes locking force. Data-Logic Processor controller and with injection control package, tool data storage and cycle time diagram. Includes weighing m/c to monitor m/c safety and quality of parts. Total shot weight- 1100 grammes. 2-off Frech DAW63A Hot Chamber Die-Casting Machine with 68 tonnes locking force. SBC 4.0 controller and 2-Stage injection unit. 1-off Frech DAW50A Hot Chamber Die-Casting Machine with 60 tonnes locking force. SBC 4.0 controller and 2-Stage injection unit. Total shot weight- 770 grammes. 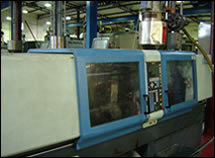 5-off Frech DAW20A Hot Chamber Die-Casting Machine with 24 tonnes locking force. SBC 2.0 & SBC 4.0 controllers and 2-Stage injection unit. Total shot weight- 357 grammes. 1-off Mk 28 Hydraulic Hot Chamber Die-Casting Machines both with a 200 tonnes locking force, full Micro-Processor controls and 3-Stage injection units. The Department has a dedicated Engineering & Maintenance team that is located within the Foundry itself allowing any machine breakdowns to be dealt with speedily along with support as necessary by external Frech Service Engineers.